At a cost of $1,500, this was one cheap boat - and we love it. At a cost of $1,500, this was one cheap boat – and we love it. Granted, it came with an eight-horse outboard that was a bit tough to start. So I sold it on eBay, and replaced it with a 15 Suzuki I had sitting in the shed. the Suzuki has a book value of $1,500, but I got $900 for the other motor, so it represents a total package expense of $2,100. Then we put another $400 or so into the boat, adding things like rodholders and a cheap fishfinder. So, what did we get for a $2,500 expenditure? a 14-footer that cruises at around 15-mph, and has already been used for dozens of fishing trips, crabbing, and even mere joy-rides. It’s gotten me out on the water more than usual this year, because it’s so easy to handle – several times when I had a time-window too small to deal with our big boat I jumped into this one, and went fishing for just an hour or two. There’s virtually no time in cleaning it up, and minimal gear is necessary for a quick fishing trip. In a nutshell, buying a cheap boat like this is a KISS method of boating and it works great for quick jaunts out onto the water. Does the boat look good? Um… not really. Can it take me far out into the bay? No way. Does it have amenities like a stereo, comfortable seats, and a livewell? Not by a long shot. But on a dollar-for-dollar basis it probably gave me more bang for my fishing buck this summer than any boat I’ve ever owned. So if you think you can’t afford a boat, or if you think you can’t afford a second (third, fourth) boat, think again. 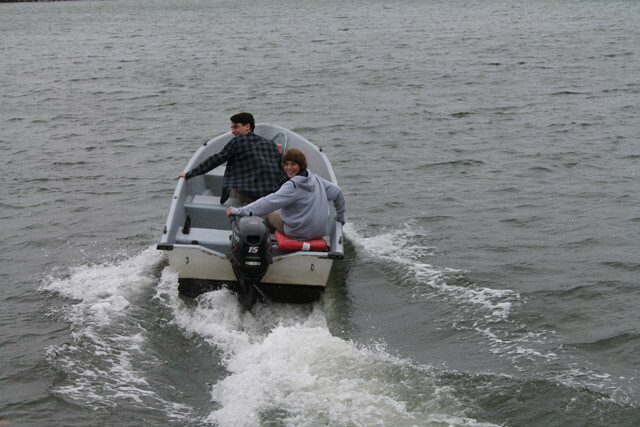 There are some super cheap boats out there that aren’t just a good deal, they’re a good deal on fun.